I flew today from Burlington to Detroit by way of Philadelphia. If you fly US Air, sooner or later you’re going to be landing in Philly. I get to the airport and the flight out is delayed. But I’m assured that I’ll get there in time. There are only 4 of us on the flight out of BTV, so we can get in the air quickly. My flight to Detroit was at 8:40, but we should get into Philly by 8:00. And so we did. Before take off the pilot (and the ground crew) said it was a 45 minute flight. We take off and about 15 minutes later the pilot comes on and says “we’re 15 minutes into our 55 minute flight and should be in Philly by 8:30. The flight attendant tried to reassure us – others had flights at 8:45 & 8:55. I decided there was nothing I could do about it. It turns out we did land at 8:05. I got off the plane and the gate agent hands me a boarding pass for the first flight in the morning to Detroit, and says if I run, I can make the flight this evening. I, and the others, run for the shuttle to take us to the other side of the airport. I run to the gate on the boarding pass – no plane there. Out of breath, I ask someone where the gate is for the flight and run to it. More out of breath, I get there and…they haven’t even started boarding the #%*$&@~ plane! They had to replace a piece of equipment, so they were running a bit behind schedule. Don’t these gate agents get updated info before the flight arrives? There were only 4 of us on the flight, going to 3 planes. How hard could it be? Needless to say, I got on the plane (where I am typing this now) and look forward to being in Detroit. But not necessarily to flying home thru Philly. 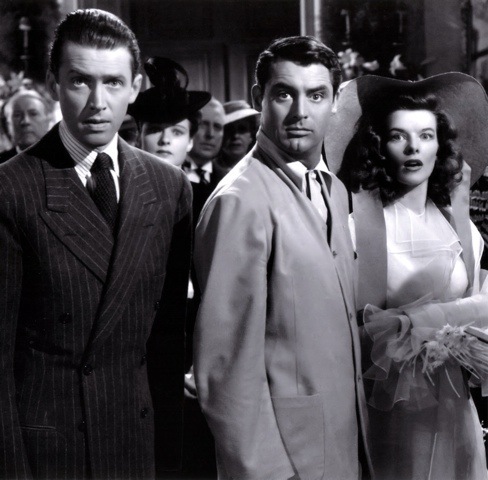 BTW – the picture is from the film “The Philadelphia Story” – one of my favorites.